This project includes a layered background and true rusty technique to give an overall sense of timeworn grunge. 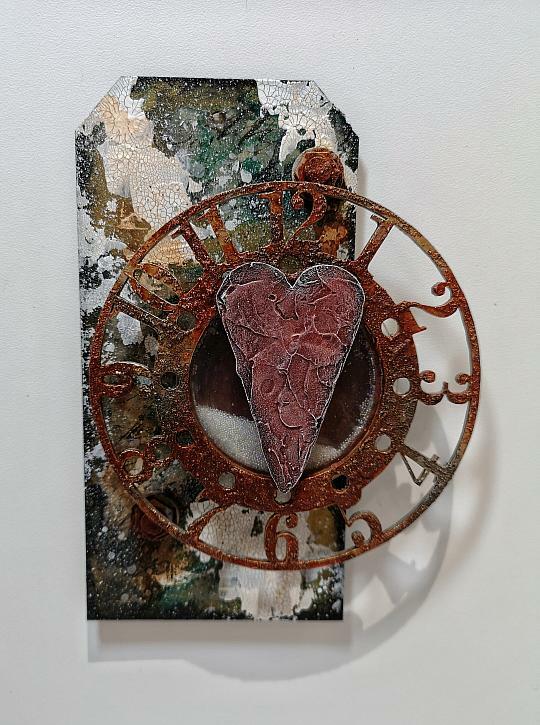 I often include hearts in my projects, usually building the project around the different feeling’s hearts can evoke. As with a lot of my work it tends to be feminine, but with a grungy twist. I love texture, so it is important to me to find items that really highlight the layers I like to use. Find DecoArt Media products in the DecoArt online store. Step One: Whenever creating a project, I find it easiest to plan my layout first before painting or gluing anything. Once you are happy with your design layout take a photo for reference. Next paint your tag in a base layer of Paynes Grey. Around the edges, add a layer of wax – this will form a resist. Step Two: Paint over the tag in a layer of Metallic Gold. Once dry, use your heat tool to melt the wax and use a baby wipe to rub away the paint in these areas, revealing the layers underneath. Rip sections of decoupage papers and glue these to the tag. Step Three: Add washes of Paynes Grey and Phthalo Green-Blue across the tag, building the intensity of colour. You can even add splatters of paint for a more textured effect. Once you are happy with the look, use a sponge to add a border of Paynes Grey to the tag. Step Four: Once your paint layers are dry, take a palette knife and Crackle Paste, and spread this over the tag – making sure there are no harsh lines. Set this to one side to dry. Step Five: Once the paste is dry and the crackles have formed, add a wash of Quinacridone Gold to knock back the stark white of the paste. Step Six: To finish the tag background, add splatters of white. Adjust the size of the splatters by using smaller or larger brushes. Step Seven: To create the rusty effect on the clock dial, being with a rough layer of Texture Sand Paste to the dial surface. Step Eight: Once dry, paint the dial in a layer of Metallic Silver. Step Nine: Add washes of Paynes Grey, Burnt Umber, Yellow Oxide and Quinacridone Gold to the dial to begin the rusty effect. Step Ten: Add neat Quinacridone Gold across the dial, building up areas. Use your heat tool to bubble the paint adding more texture. Step Eleven: Repeat this same rusty technique on two bolts, a disc and ring. Step Twelve: Glue an acrylic disc to the reverse of the clock dial, followed by the ring. Once the glue is set – pour in your glass beads before sealing them in place using the disc. Step Thirteen: For the textured heart, using a palette knife - roughly apply a layer of Modeling Paste to your greyboard heart. Step Fourteen: Once the Modeling Paste is dry, paint the heart in a coat of Cadmium Red Hue, being sure to get into all the spaces created by the paste. Step Fifteen: Add a wash of Paynes Grey to the heart, the wash will pool where you have created texture. Step Sixteen: Use a soft dry brush and dry brush the heart in white to highlight all the texture created by the paste. Step Seventeen: To finish, glue the dial off set to the tag base, add the bolts just under the dials edge and finish with the textured heart to the dials centre. Be sure to visit Hannah Oxberry Blog for more projects and to learn more about Hannah Oxberry.